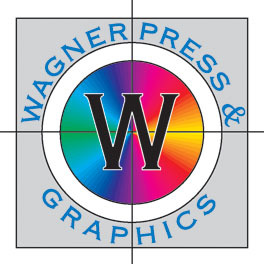 About Us - Wagner Press & Graphics, Inc.
Wagner Press & Graphics, Inc.
it is a Creative Center assisting companies with the development of ideas and the dissemination of information from concept to the delivered job. We want the opportunity to work with you and demonstrate our capabilities. Obviously, you have many printers to choose from. The major criteria for the selection process usually involves quality, pricing, and timing. We have very strong beliefs regarding each of these. Any printer can place ink on paper and reproduce an original with varying degrees of quality. We are a small and thorough printing company. Every job demands and receives our total concentration. Quality should never be sacrificed for time or money. We believe each job is a reflection of our business and we take that very seriously. Any client can find a printer who will do a job “cheaper.” Obviously “cheaper” is not always better. We have built a solid reputation for over 40 years in the printing industry. We recognize timetables, both yours and ours. We can turn around some jobs in hours, others in a few days. Efficiency allows a small company such as ours to move competently through each phase of a schedule to maintain consistent timing without sacrificing price or quality.